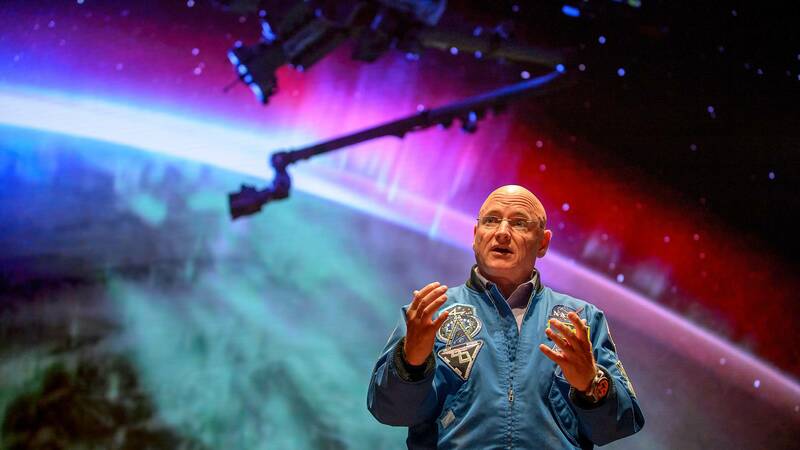 Astronaut Scott Kelly in "Beyond a Year in Space"
What happens when you're not defying gravity anymore? After re-entry, when your feet are on solid ground again? Astronaut Scott Kelly spent a full 12 months on the International Space Station — the longest space mission in American history. Beyond a Year in Space, premiering at 9 p.m. Wednesday, picks up the story with Kelly’s last day in space and return to earth, following his homecoming and long-awaited reunion with his family. The film also tracks the extensive medical testing undergone by Scott and his brother and fellow astronaut, Mark Kelly. As identical twins, the brothers presented NASA with the extraordinary opportunity of conducting experiments on two individuals who have the same genetic makeup but spent the year in vastly different environments. The data from the twins study will help NASA determine what it will take for humans to endure long-duration space travel in preparation for a mission to Mars, an unprecedented three-year journey. Scott Kelly’s story was first told in 2016 in A Year in Space, which will rebroadcast at 7 p.m. Wednesday. Beyond a Year in Space also introduces the next generation of astronauts currently training to leave Earth’s orbit and travel into deep space. "Timely and wondrous, Beyond a Year in Space reminds viewers that we’re all part of something bigger. Just look up," writes Orlando Sentinel's Hal Boekeker.